“anthology” books, in that there is a storyline that begins and ends each book, with different creators working on smaller stories within the larger framework of the series. As with any such series, there is good and there is bad, but the strength of the creators (Geoff Johns, David Goyer, Michael Chabon, Howard Chaykin, Mark Waid, Michael Lark, etc) ensure that the hits far outweigh the misses. The guy in red is actually Adolph Hitler's transplanted brain in disguise. Whoops, spoiler alert! regular continuity that it’s pretty easy to just consider this as a regular JSA story. If it isn’t continuity by now, then it should be. This story has everything you could want in a superhero comic book: Plenty of action, some tales of redemption, and the transplanted brain of Adolph Hitler. James Robinson and Paul Smith have created that rare superhero story here: One that gets better every time you read it. 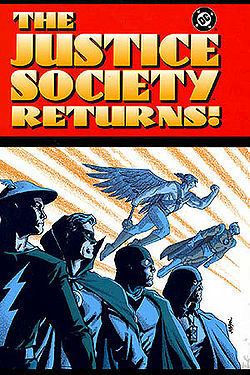 After the success of titles like Starman & Sandman Mystery Theatre, it was obvious that the comic book masses wanted more Justice Society. The Starman team of David Goyer and James Robinson started the new series, and quickly handed it over DC wunderkind Geoff Johns. When this series was on the stands, it was something I enjoyed quite a bit, and so I thought rereading it would just be a formality. Don’t get me wrong, I still liked it for the most part, and I’m keeping the run. But Geoff Johns bites off way more than he (or any one else) can chew, and the constantly growing cast of characters are tough to keep track of, even for jaded comic book fans. Plots start and stop with no explanation, and characters show up and then leave with very little reason as to why they were there in the first place. 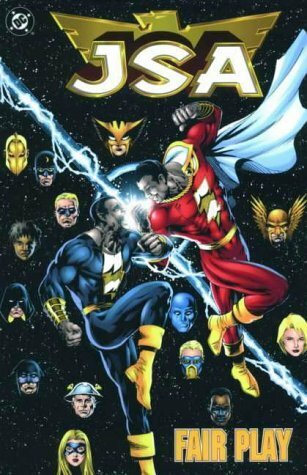 The hits (finally making sense of Hawkman’s origin, slowly turning Black Adam into the most tragic villain in the DCU, Stargirl’s transformation into one of the DCU’s premier teen heroes) far outweigh the misses (Dr. Fate’s constant bitching), and this stands up as a pretty decent mainstream superhero title. 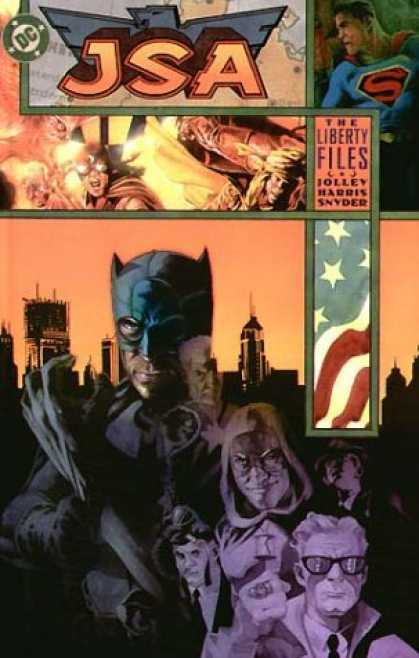 Ghost Stories wasn’t a Geoff Johns story, but it ended this version of the series pretty well. Who is: Superman from Earth 22? Alex, I'll take: Reasons why nobody takes superhero comics seriously for a thousand! really sure why a reboot was needed, since the writer for the new series was the same person who wrote most of the last one. Since one of the criticisms of the last series was that there were too many characters to follow, it only stands to reason that Geoff Johns brought even MORE characters into the mix. That being said, I would say that I enjoyed these trades more than the last 3 of 4 of his previous run, and Thy Kingdom Come is definitely a worthy quasi sequel p to the landmark Kingdom Come mini it gets its name and concept from. Also, Dale Eaglesham’s pencil work is perfect fit for this book. 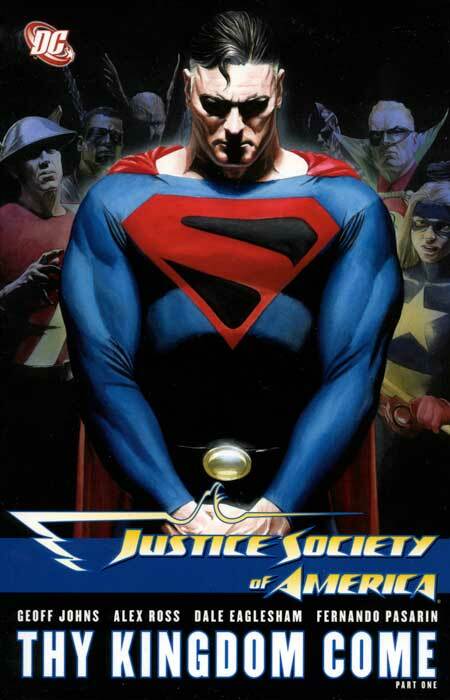 As I’ve written before, I don’t have a lot of respect for the “Elseworlds” concept. More often than not, it led to lazy writing as opposed to real storytelling innovation. A bizarre alternate dimension where superheroes aren't quite so ridiculous. Great stories are great stories, and should always be the top priority when putting together sequential art for a mainstream audience. When the strongest thing about your gimmick is the pitch, then it probably wasn’t that strong a gimmick in the first place. The Liberty Files, and it’s sequel The Unholy Three, are rare exceptions. 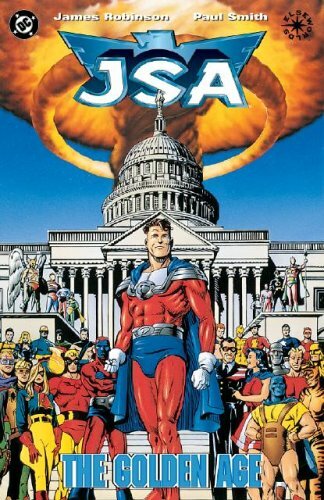 In this world, the JSA are all secret government agents rather than costumed superheroes. The emphasis here is on telling a compelling espionage story rather than resting on the laurels of its high concept pitch. Next up: Legion Of Superheroes, Lex Luthor, and Manhunter!!! This entry was posted in Comic Books and tagged Comics, David Goyer, DC, Geoff Johns, JSA, Justice Society, Mark Waid, Tony Harris. Bookmark the permalink.